The company's latest wireless speaker model is now available. 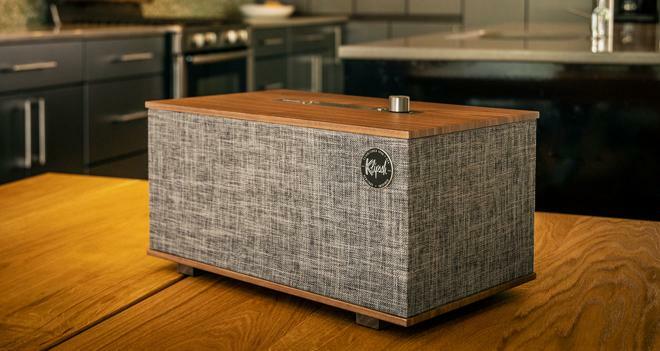 Klipsch has announced the release of its next generation Heritage Wireless speaker. The new version of The Three includes integrated Google Assistant support. The stereo table-top speaker features 2 x 2 1 /4” (57.15mm) full range drivers, a 5.25” (133.4mm) long-throw woofer, and 2 x 5.25” (133.4mm) dual opposed passive radiators. In addition, the unit is rated for 106dB (0.5M near field) and a frequency response of 45Hz ~20kHz @ -3dB. Meanwhile, Google Assistant support is now built-in as well, allowing users to stream music, ask questions, get information, control smart home devices, make phone calls, and more through hands-free voice commands. Bluetooth wireless connectivity, multi-room audio, and Chromecast capabilities are also implemented, along with 192kHz / 24-bit decoding for high-res audio playback from supported services. The Three Heritage Wireless Table-Top Speaker with Google Assistant is now available with a genuine walnut veneer cabinet and a heather gray grille cloth for an MSRP of $499.